Today was again a good day for painting. I managed to finish the warlock's skin, their hair, the hoof and some random bits. Still left to do is the weapons and odd metallic bits. The only one with a blade partly painted. I think the finished look is pretty nice so far. Still need to decide on the horse front plate. 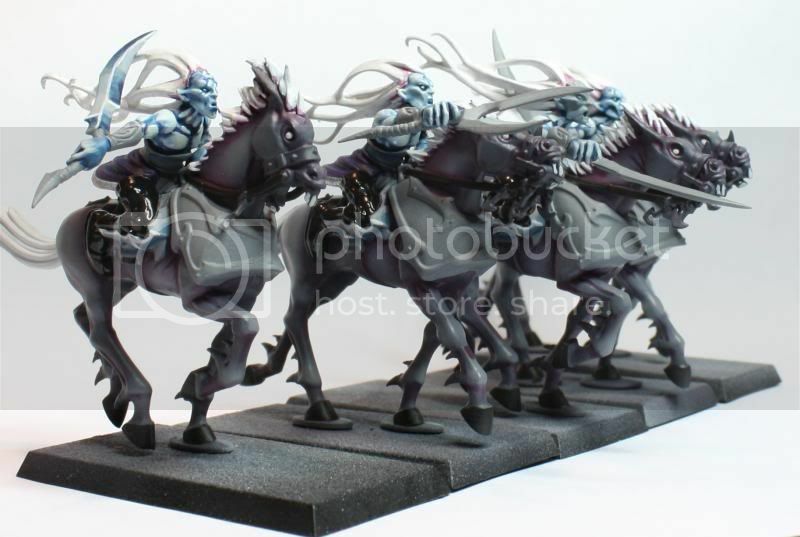 In the end, i went with the same color as the horses exactly, not adding any shade to the hair (just like the Witches). Jury's still out to decide if it look finished or not. I think it does, but some could say it doesnt. I decided to paint the horse briddle black, just so it doesnt attrack attention in any way. Doubt i'll add any highlight. Once the metallic bits are painted, i think it'll be enough color already. 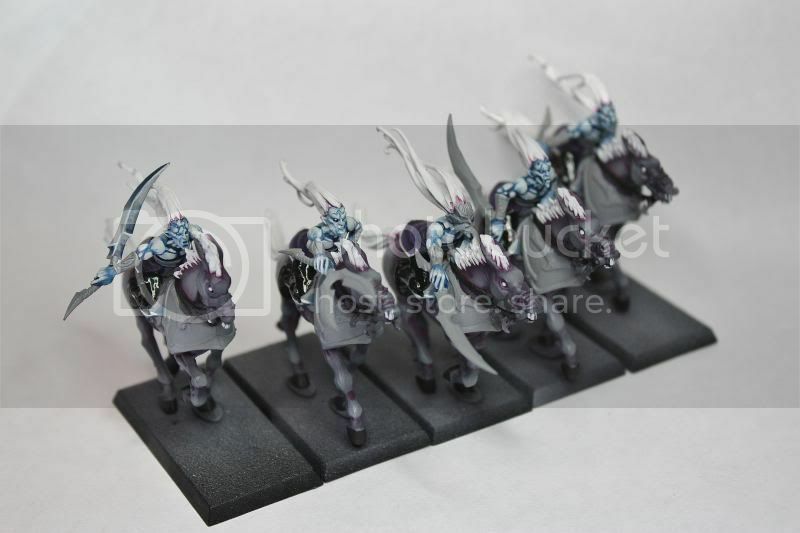 With the correct base, i think these will look amazing... or at least i hope. Once grouped up, it really starts to look like a finished unit, and i actually can't wait to have them next to my witches/Cauldron on the table. The 10 of them are actually painted exactly like that. Tonight i'm hoping to do at least 1/4 of the weapons, and finish the rest tomorrow. 1 Box of Executionners, to bring the new model total to 30, and the total (old and new) to 60. 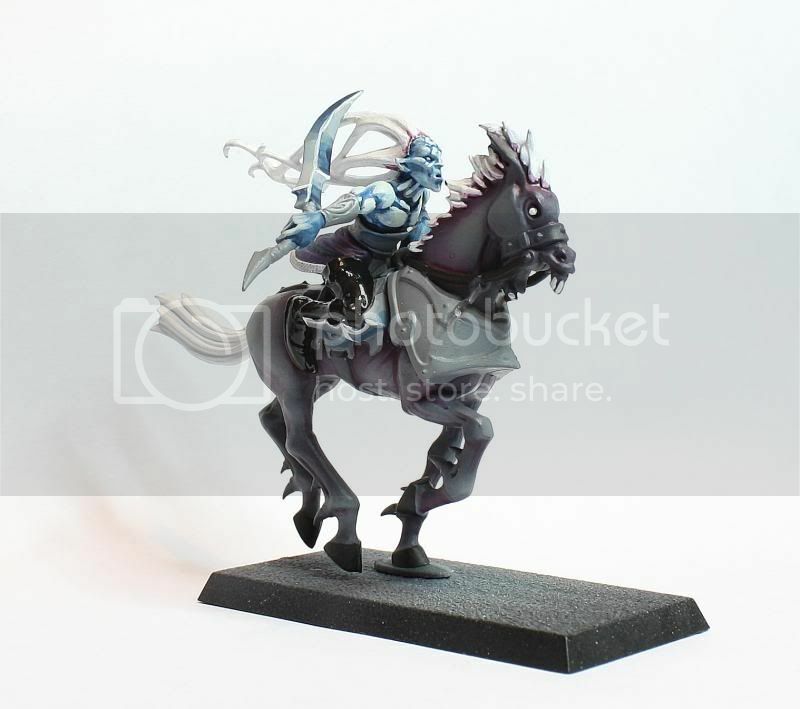 1 Bretonnian Pegasus Knight, to make a Dark Pegasus Master. Looking forward to Christmass morning 2.0.